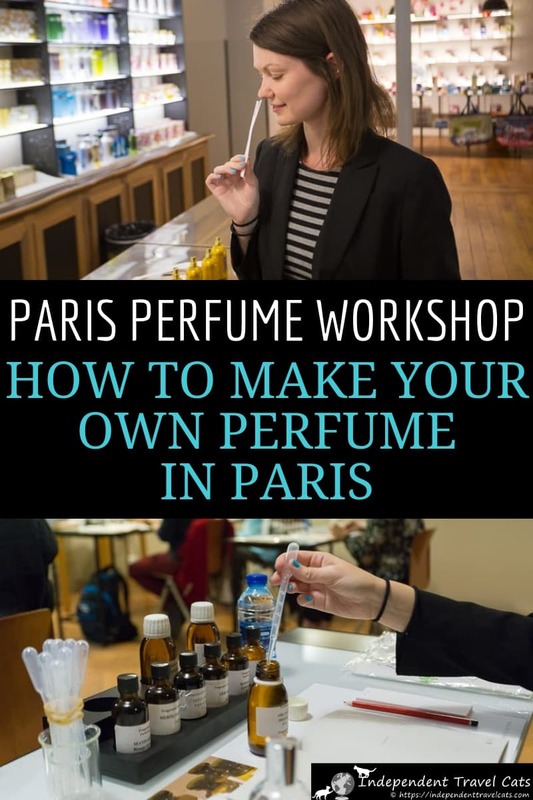 Did you know that you can create your own perfume in a Paris perfume workshop? You have several options where you can develop your own personal fragrance with personal guidance from a professional nose during a perfume creation class in Paris. 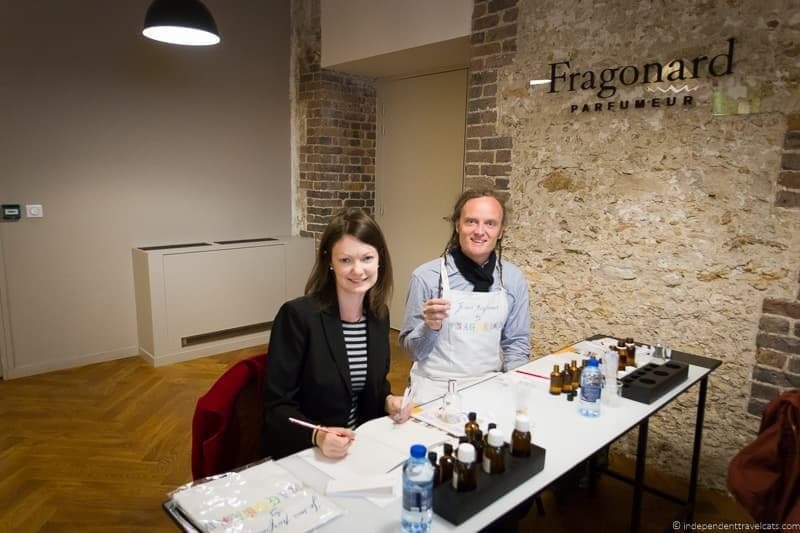 Laurence and I attended the Fragonard perfume workshop in Paris on my birthday and we had a lot of fun learning, sniffing, and concocting during this hands-on perfume workshop. 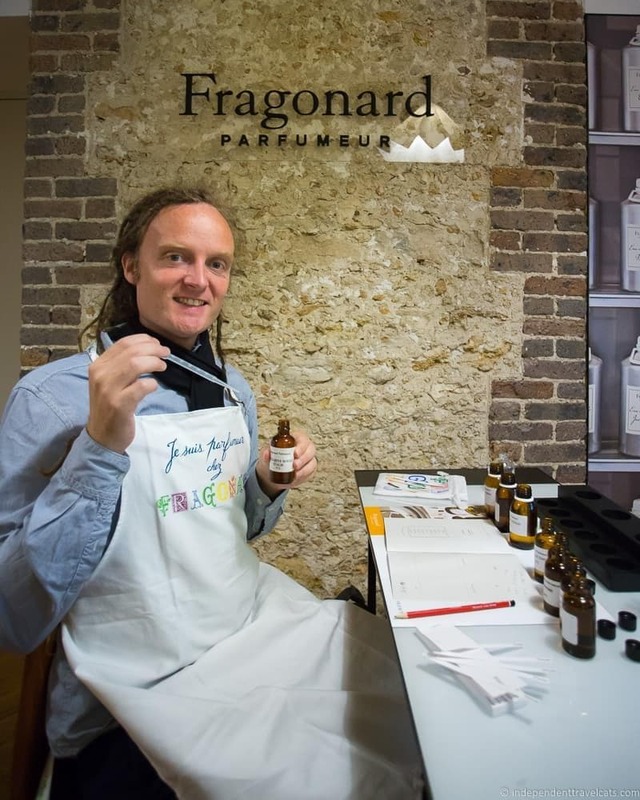 Fragonard offers guests the opportunity to book a workshop that allows them to develop their own eau de cologne with personal guidance from a professional. 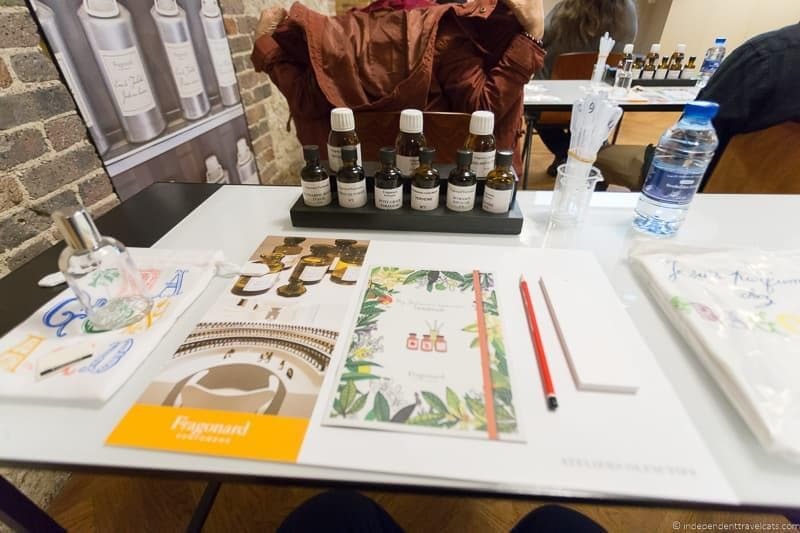 Workshop attendees learn about the history of perfume, smell the main ingredients for eau de cologne, devise their own perfume formula based on their personal preferences, and then mix and bottle their own perfume. Interested in attending a perfume workshop in Paris? We’ll share a bit of history of perfume making in France, how you can make your own custom perfume in Paris, how to book a Paris perfume workshop, what to expect at a perfume creation workshop, and share Laurence and I’s own experiences making perfume in Paris. The history of perfume dates back more than 3,000 years, and is believed to have originated in Mesopotamia and Egypt. The word perfume comes from the Latin word perfumare, meaning “to smoke through”. Ancient perfumes have been discovered all over the world, including Egypt, Cyprus, India, and Italy. Perfumes have been used for medicinal purposes, as part of spiritual and religious rituals, to mask bad smells, to ward off evil spirits and diseases, and as aphrodisiacs. Early perfumes developed for the purpose of simply smelling nice often had one main natural essential oil (e.g., rose water). Most perfumes were scented with natural essential oils until synthetic scents (introduced in the late 19th century) became popular in the 20th century. Modern perfumes, such as the ones we wear today, have their origins mainly in the 19th and 20th centuries and the majority contain a blend of natural and synthetic ingredients. Although perfume was not invented or perfected in France, France has come to be seen as the center of the modern perfume making world for a couple of reasons. 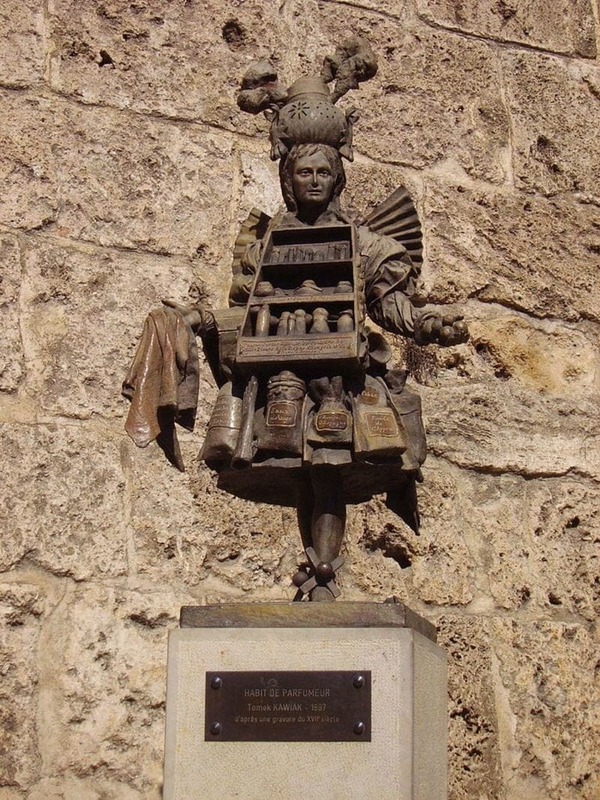 First, the French Riviera town of Grasse in southern France is considered the perfume capital of the world. In the 16th century, glove makers in Grasse began selling perfumed gloves to appeal to the nobility and begun farming a number of flowers used in the production of the fragrances. In the 18th century, there was more demand for scented pomades, ointments, and perfumes in France and companies like Galimard sprung up in Grasse. New production methods combined with a large amount of harvested flowers allowed Grasse to become the center of the French perfume industry. 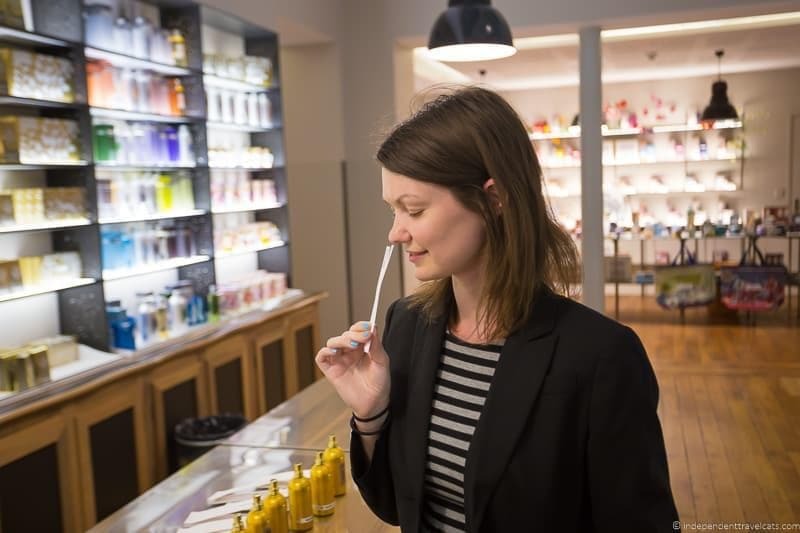 Today, dozens of fragrance companies are headquartered in France and many of the world’s top perfumers (called nez or noses) train and work here. Grasse is the headquarters for well-known French perfume houses Galimard, Molinard, and Fragonard. The second reason France is associated so strongly with perfume is that it has become a world-leader in perfume marketing and sales. France, particularly Paris, has been long associated with fashion, luxury, and style. Mixing perfume with haute couture has been a winning combination for a number of French fashion labels. A number of French cosmetic and luxury fashion brands, such as L’Oréal, Chanel, Christian Dior, Jean Patou, and Yves Saint Laurent, produce some of the world’s most popular perfumes. Probably the most famous perfume in the world is the iconic Chanel No. 5 which launched back in 1921. Successful marketing and brand promotion has continued to link Paris and perfume in many consumer’s minds. There are a number of perfume workshops in Paris that you can choose from, these last from about 1 hour to 3 hours, depending on the course. All allow you to take home you perfume creation at the end of the workshop. 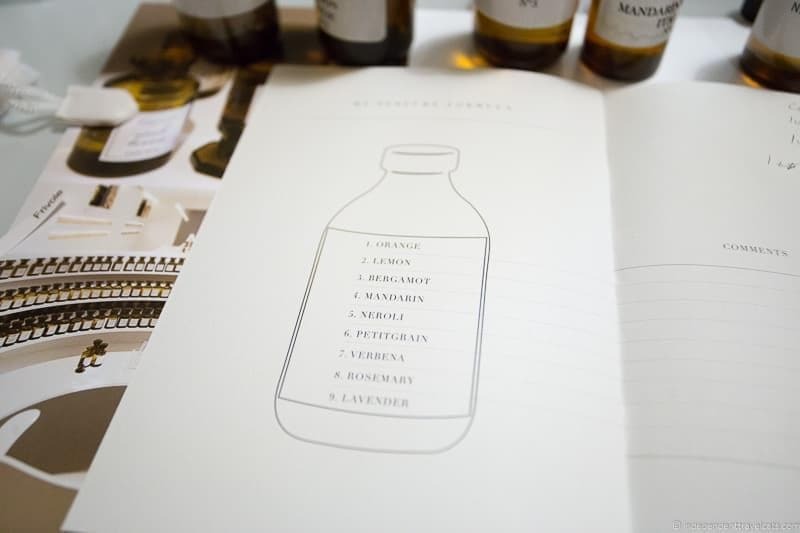 This 1 hour workshop guides you in creating a perfume from 90 different Molinard essences. Molinard is another of the main perfume creation companies in France. Participants take home a 50ml bottle of their own perfume. 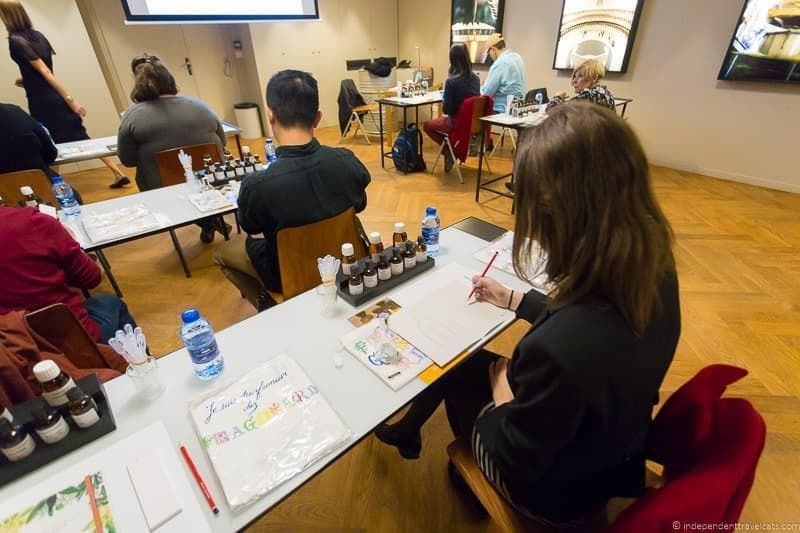 This 1.5 hour apprentice workshop with Fragonard allows you to create your own eau de cologne from 9 essential essences and take home a 100 ml of their created scent. Best for those who enjoy citrus based scents. This 90 minute workshop that allows you to created your own perfume with Candora. Participants take home a 50ml fragrance that they created. 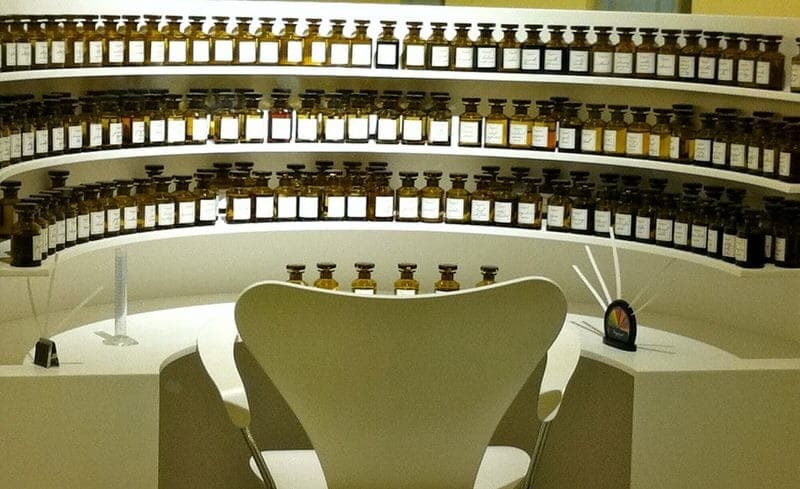 This 2 hour private VIP workshop helps you create a 50ml bottle of your own custom fragrances from 90 Molinard essences. Also includes a glass of champagne, drinks, and snacks. 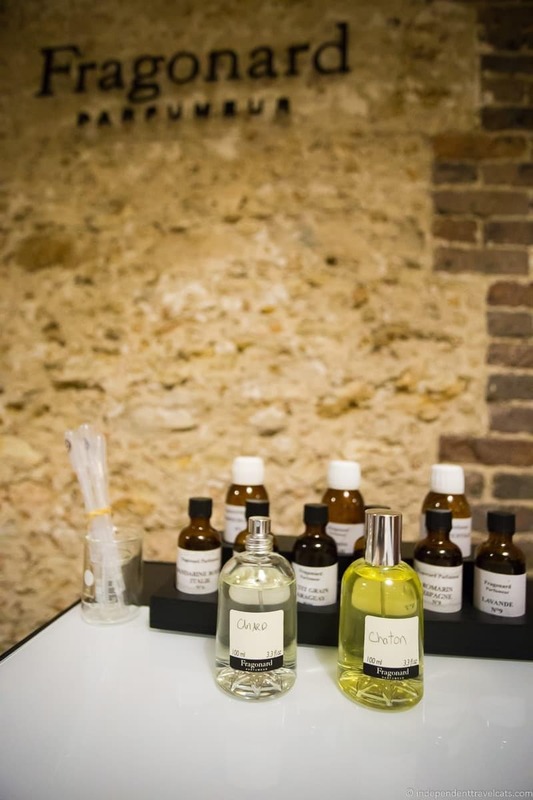 This 2 hour workshop and class is led by perfumer with over 20 years experience in her own home in the 16th arrondissement. This 2 hour workshop allows you to create you own personal perfume using over 200 different essences. Take up a 50 ml bottle of your fragrance. This private family course allows for the whole family to create their own fragrances together with an instructor. Parents get to take home a 50ml spray bottle and children 15ml. Workshop designed for children age 7 and older. We did the Fragonard Paris Perfume workshop on our last visit. Below is all the main information you need about the Fragonard Paris perfume workshop including cost, how to book, and how to get there if you decide to do this fragrance workshop. Public Transit: Closest Metro stops to Fragonard are Opéra (lines 3, 7, 8) and RER A Auber. Buses that stop nearby are 21, 22, 27, 52, 53, 66, 68, 81, 95. Most hop-on, hop-off sightseeing buses also stop near the Opera Garnier which is across the road. Parking: No parking is available on-site so you’ll likely need to find a parking garage. We don’t recommend driving in central Paris, and would instead recommend taking public transit or a taxi. 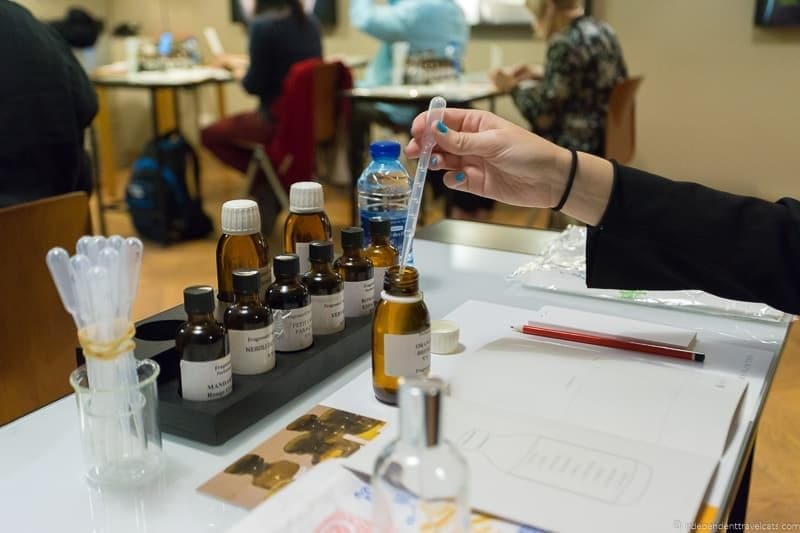 Prices (as of Dec. 2017): 95 euros per person for the Perfumer Apprentice Workshop. NOTE: It is free to visit the museum (must join a guided tour) and the Fragonard store. Duration: The Perfumer Apprentice Workshop lasts approximately 1.5 hours. 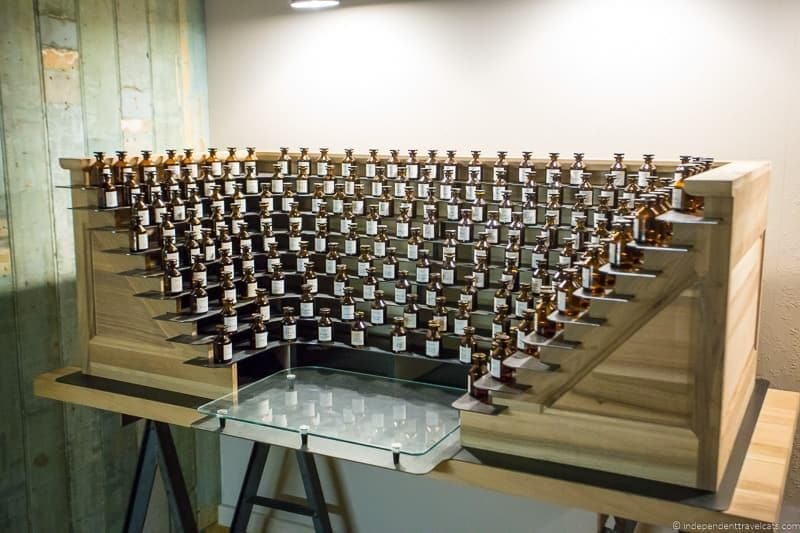 However, all attendees are invited to join a guided tour of the Perfume Museum which lasts about 45 minutes. All attendees are recommended to arrive at least 15 minutes before their workshop. If you plan to do the perfume workshop, the guided museum tour, and check out the store, I’d recommend allocating 2.5 to 3 hours to make sure you have enough time here. Workshop Dates & Times: You can check the website for the latest schedule, but most workshops in Paris are offered weekly on Saturdays. They are currently (as of January 2019) being offered at 10:00am (10:00) in French and 1:00pm (13:00) in English. Is the workshop only for women? No, you create a custom eau de cologne in the workshop which is a unisex scent that can appeal equally to men and women. Although the workshop attracts more women, both men and women attend the workshops. Can I book a perfume workshop as a gift? Yes, there is an option to book it for someone else on the website. Could definitely make a nice birthday or anniversary surprise! Can children participate? : Children age 12 or older are welcome to sign up and participate in the Fragonard workshop. Unfortunately, young children are not allowed in the perfume workshops. What should I wear? : There is nothing you need to consider in terms of clothing as you get a free apron during the perfume workshop that you can wear to prevent spills on your clothing. A hair band may be useful for those with long hair. Booking Reservations: Reservations are necessary to attend the perfume workshops and bookings can be made online here or at the Fragonard Workshop page. Be sure to double check the language and location when making your booking! Questions? : You can check out their website, call them at +33 1 40 06 10 09, or email them at tourisme@fragonard.com. What do I get to do during the Fragonard Perfume Workshop? The Fragonard Perfumer Apprentice Workshop begins with a brief presentation about perfume and its history led by a perfumer. Then you go through the nine essential aromatic essences that you will use to create a eau de cologne, smelling and taking notes on each. After you are done smelling each, you create your own perfume formula with the help of the perfumer. Then you make, bottle, and name your own perfume. Each person is provided with all the tools they need to create their own bottle of eau de cologne, and at the end of the workshop you get to take home a 100 ml (3.3 fl oz) bottle of perfume, your perfume notebook, a drawstring bag for the perfume, an apron, and a perfume workshop completion certificate. 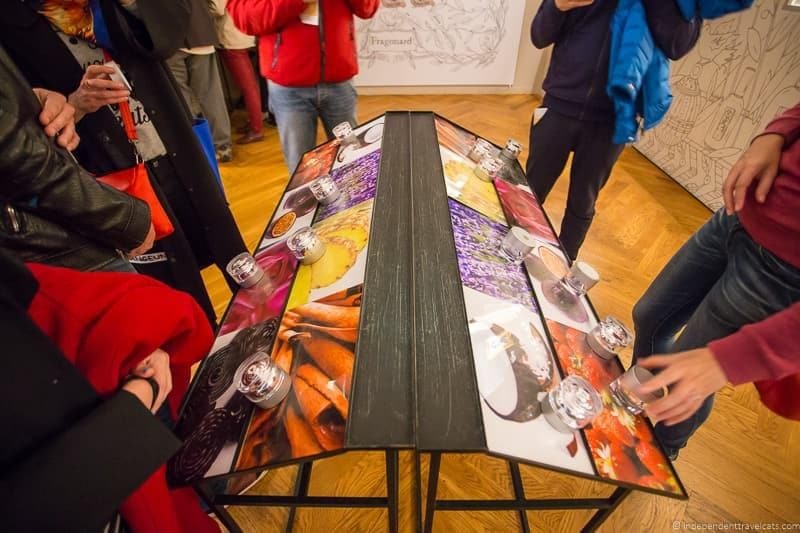 Afterwards you are invited to join a guided tour of the Museum of Perfume. What if I want to just visit the Fragonard Museum of Perfume? If you only want to visit the Musée du Parfum (this is at the same location where the perfume workshops are held), you can visit the museum for free as part of a guided tour. Tours are given about every 20 minutes or so in French or English and last 30 to 45 minutes each. The tours cover the history of perfume, the history of Fragonard, perfume manufacturing techniques, displays of perfume equipment and special bottles, and an olfactory game. After the tour, participants are led to the Fragonard store to smell some of the most popular Fragonard perfumes. Expect a soft sell at the end of the tour, but no purchase is required. You must be on a guided tour to visit the museum. Children of all ages are welcome on the museum tours, and reservations are not necessary. If you require a language other than French or English, contact the museum in advance to see when a tour will be available in your language. If you are a perfume connoisseur or want a specialist tour or talk, these are available on certain days of the week. These do have a fee and need to be booked in advance. The Fragonard perfume store located in the same building can be visited at any time. MONEY SAVING TIP: If you have a Paris Pass, be sure to show it at the Fragonard shop to receive a free gift. You also receive 10% off any items purchased in the store with the pass. Where can I Find Other Perfume Workshops in France? 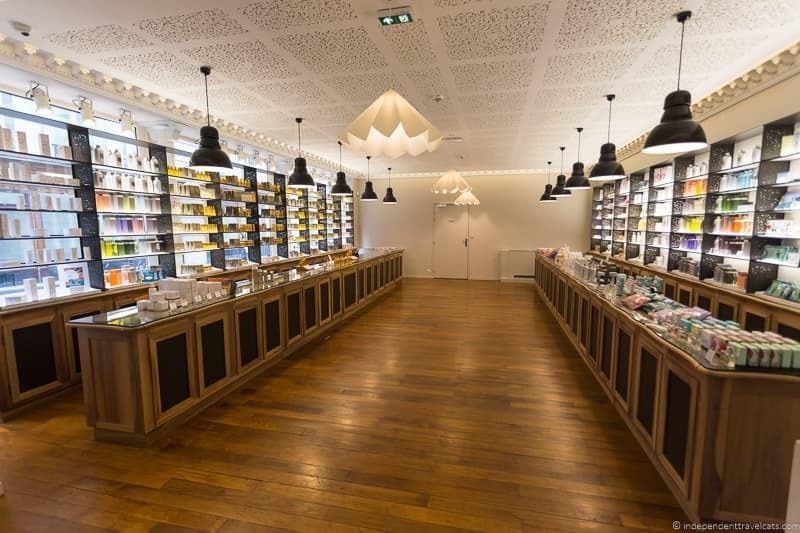 If you are traveling outside of Paris, you may want to check out perfume workshops in other locations as well, particularly in southern France. Cities to consider are Grasse, Nice, Cannes, and Eze. Again the most notable companies offering these workshops are Fragonard, Molinard, and Galimard. You can find Fragonard workshops and tours in other locations in France. Fragonard has locations in Paris, Grasse, Cannes, and Eze. In Grasse, you’ll find their headquarters, a factory, and a larger perfume museum. They offer free guided visits of their factory and museum, as well as the opportunity to book a perfume workshop. They offer a 2 hour fragrance workshop to create an eau de cologne (similar to Paris) that also includes a tour of the perfume factory. You can take a look at their Cannes workshop which takes place in their shop in the city center. They also have a factory in Eze which provides free guided visits throughout the year, and where they have occasionally also offered perfume workshops. Molinard offers both regular workshops and private creation workshops in Grasse. The company also offers both group workshops and private creation classes in Nice as well. Galimard also offers perfume workshops in Eze and Grasse. You can read about my prior visit to Grasse and my Grasse perfume workshop experience with Galimard. We were invited to attend the Fragonard Perfumer Apprentice Workshop in Paris as travel writers, and were happy to do so in September. I have been wearing French perfume (Galimard and Fragonard) since 2012 so it was natural fit. The date of the perfume workshop happened to coincide with my birthday so it made for a fun birthday activity which was followed by afternoon tea at the Ritz which Laurence had booked for me. That morning we were running a little late for the workshop after a minor metro incident, but we arrived only a few minutes late. We checked in at the reception desk at the Musée du Parfum (a short walk from the beautiful Palais Garnier opera house), and were then led downstairs to the workshop room. There were 20 people (16 women, 4 men) in the workshop and tables were set up to seat 2 persons per table. In front of each of us were the perfume ingredients and supplies, beakers, an eyedropper, perfume testing strips, an apron, bottled water, a notebook, a pencil, and a reusable carrier bag. A women soon introduced herself as a perfumer and our workshop leader, and we were ready to get started! The beginning of the workshop starts off with a presentation that includes a bit about the history of perfume, how perfume is made, the fragrance pyramid, and the different types of fragrances. The perfumer explained to us that during the workshop, we will be making an eau de cologne (which means “cologne water” in German). The first eau de cologne is believed to have been created by Italian perfumer Giovanni Paolo Feminis in the last 17th century and the name is believed to have come later from his nephew Johann Maria Farina who lived in Cologne, Germany. Probably the world’s best known eau de cologne is 4711 which was created in the 18th century and a version of it is still sold today! It contains bergamot, lemon, orange, lavender, rosemary, and neroli. We were taught that the traditional aromatic ingredients (in addition to water and ethanol) of a eau de cologne are citrus oils such as lemon, sweet orange, tangerine, grapefruit, mandarin orange, lime, and bergamot. Most eau de colognes also contain aromatic herbal oils such as lavender, neroli (orange blossom), thyme, petitgrain bigarade (bitter orange leaf), rosemary, and lemon verbena. Now if you are not familiar with the different perfume types such as eau de cologne and eau de parfum, the differences lie mainly in the concentration of aromatic ingredients. In order from weakest to strongest (least concentrated to most concetrated) are: after shave, splashes, and body sprays, eau de cologne, eau de toilette, and then eau de parfum. An eau de cologne generally has 2% to 6% aromatic concentration compared to an eau de parfum which normally has a concentration from 10% to 20%. The above all means that you are creating a citrus based scent that will be fresh, light, and good for daytime wear, but not something that is likely to last all day or be the best evening time scent. If you don’t enjoy the smell of citrus, this might not be the best workshop for you although you can also create a scent for a friend or loved one. Most of the scents are considered unisex so it is easy to create a scent that is appealing to women or men. Next we started learning about each of the 9 potential essential oils we could use for our eau de cologne. The perfumer gave us a bit of info and then we were instructed to open our bottles and smell it, and then write notes about our impressions in the provided notebook. We did this in turn for each of the 9 scents (sweet orange, lemon, bergamot, mandarin orange, neroli, petitgrain bigarade, lemon verbena, rosemary, and lavender) and also smelled them in a variety of combinations. After we were done sniffing and writing notes, it was time to develop the formula for our perfumes. The perfumer gave us a rough formula recommendation to use 80% orange, lemon, bergamot, and/or mandarin, 10% of the neroli and/or petitgrain, 10% of the rosemary and/or lavender, and to add the lemon verbena in if we wished. We didn’t have to use all the oils (I used 7 and Laurence 6) and before committing, we tested out the fragrance with the perfume testing strips and also had the perfumer give us her opinion. It was fun comparing scents with each other. Next we wrote down our final formula and started mixing like mad perfume scientists. This is perhaps the most active part as you get to use beakers and eyedrops to measure out and put together your perfume into your bottle. We wore the provide aprons to keep from getting any of the oils on our clothing although it is not very messy if you are careful. Once you have your bottle filled, you can name and label the bottle, and test it out. Laurence and I both chose to use different essential oils in different amounts so although ours both are citrusy and herby scents, they are definitely distinct. We both liked our scents in the end although I tend to be most attracted to vanilla and fruit scents and generally opt to wear an eau de parfum as my daily perfume. However, this one is fresh and light and perfect for the daytime. The perfumer then went around and gave us each a perfume workshop diploma which had our names and the date of the workshop on it. After everyone was done we packed away all our things (you are given a bag to keep your perfume, notebook, bottle water, apron, etc.) and had time for a short break before starting the guided perfume museum tour. Our guide led us downstairs to explore the Musée du Parfum which is located in a Napoleon III era townhouse built in 1860. Fragonard created the perfume museum in 1983 to house its collection of perfume artifacts and to teach people about the making of perfume. 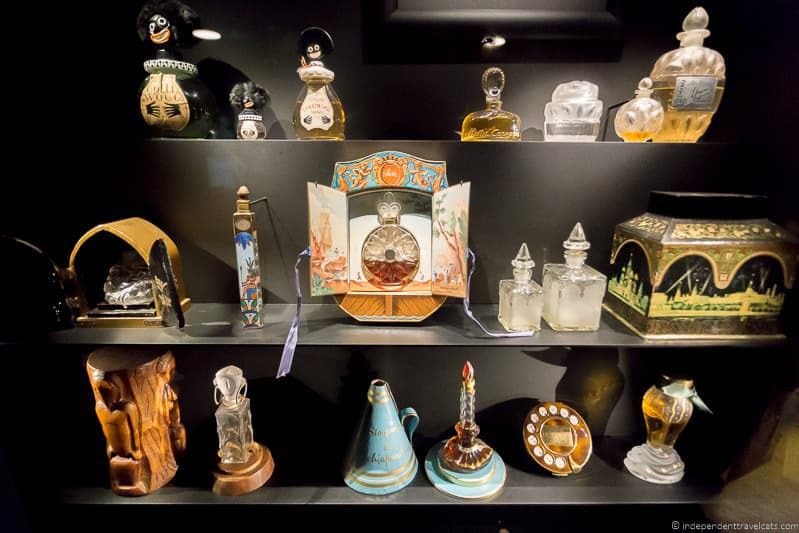 The first part of the tour focused on how perfume has been manufactured over time, and the second half focused on the museum’s artifacts which include a perfume organ, antique perfume bottles, and toiletry sets. At the end there was an olfactory game which as a group we did pretty poorly at guessing the fragrances. The tour lasted about 40 minutes. I had already done a couple of perfume tours in Grasse so most of information related to the creation of perfume I already knew although the museum objects were new and interesting. Laurence had never been on a perfumery tour before so he learned a lot from the tour. The guided tour ends, not surprisingly, upstairs in Fragonard’s store. Fragonard has a well-designed shop here where it offers most of its women and men’s fragrances for sale in the form of eau de cologne, eau de toilette, and eau de perfume as well as soaps, body sprays, body washes, room scents, and candles. A salesperson talked to us about their most popular perfumes, and we each were able to smell 5 of the most popular. Since we had done the museum tour, we were offered discounts if we purchased gift boxes or shared a gift box with other tour participants. Since we had a Paris Pass, we automatically were able to receive a free gift and 10% discount on any purchases in the store. Laurence purchased me a bottle of Belle Chérie perfume for my birthday which is a scent I had liked several years ago when I first smelled some of Fragonard’s perfumes in Grasse. Our purchase also came with a free perfume travel atomizer, which I love and I happened to be looking for one of these anyway. The travel atomizer has already come in handy on several subsequent trips! If you are new to Fragonard, they have a range of classic and more modern scents. They also have product lines built around several top floral and wooden scents for women and men (e.g., rose, lavender, orange flower, sandalwood, patchouli). 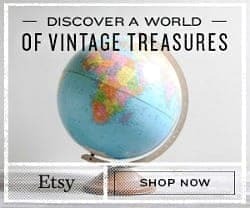 If you can’t get to a Fragonard store, their fragrances are also sold online and ship to a number of countries including the United States and United Kingdom. So that was all our time creating perfume in Paris at the Fragonard perfume workshop! We had a fun visit and would recommend it to anyone who is interested in creating a perfume in Paris. Would you be interested in creating a customized fragrance? Have you ever done a perfume workshop in Paris or visited the Fragonard perfume museum? Any questions about booking your own Paris perfume workshop? We love hearing from you, so please let us know your thoughts and questions in the comments below! Wow! 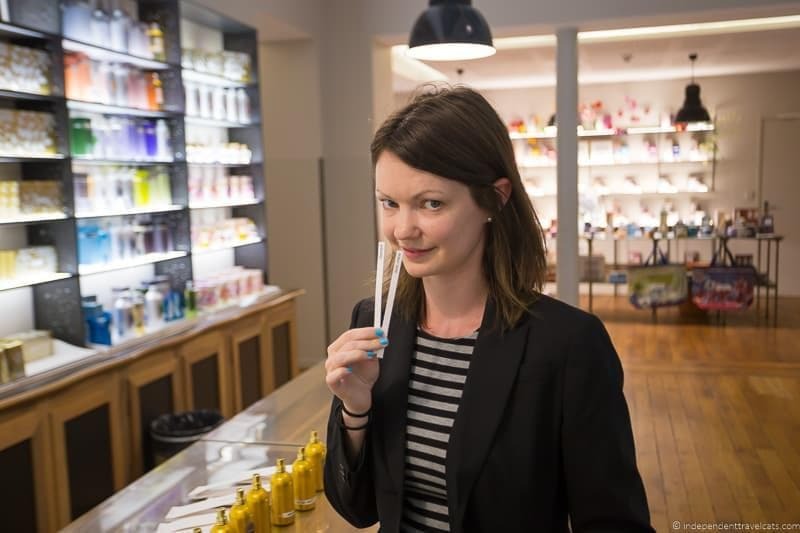 This is really worth doing in Paris and can’t want to do a perfume class like this one! Hello, Do you sell pure oil perfume in wholesale,please? Hi This is Aminullah Amiri, Do you have any training center are workshop for new candidates to learn them how to make perfume? Are the fragrances ours to keep after the workshop? Do you know where to start to make your own signature perfume? I live in the U.S., but visit Paris, annually. Sounds like a fabulous experience and something I’d love to do with my girlfriend when we next visit Paris. I had no idea that perfume had been used for such a long time! This is so cool! I know my husband would enjoy this as well as he’s got a thing for perfumeries. I think he likes all the bottles and things… Anyway, sounds like a wonderfully fun birthday activity! How fun is this? I am a perfume wearer, and I have different scents to go with different moods and activities. I always like when someone walks by smelling beautiful. I would do this… we go to Paris periodically, so I will add it to my list of fun stuff to do. 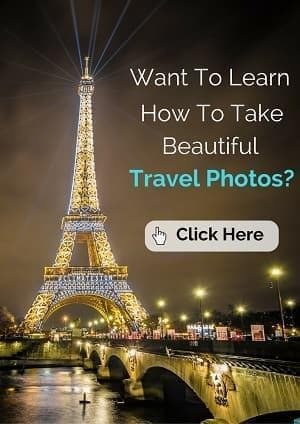 What a unique thing to do in Paris! We are only 3 1/2 hours by train so might have to go one weekend just to do this! Thanks for sharing! Hands-on workshops are always my favourites! It’s always so fun to do something yourself instead of just watching other people do it, and now you get to keep your very own perfume as well. It would make a great gift experience, I think. I hardly ever wear perfumes because they seem to irritate my nose – just standing next to someone wearing perfume in the train makes me sneeze! Did you find all the scents overwhelming? We didn’t make the time to tour Fragonard or take the workshop, and now we’re wishing we had! I could seriously curl up in a bottle of Bergamont or Lemon Verbena. It would be interesting to see how scents you like turn into a fragrance to wear. 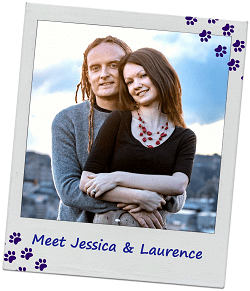 Good to see Laurence in there, too! Looks like you guys had fun! That looks like fun. Wish I’d known about this when I was in Paris in 2015. Ah, well… there’s always next time. That really sounds like a fun afternoon. I do wear perfume, but don’t really know much about the history or how it is made. I would love to make my own and then have it to wear later. Thanks for sharing! HOW FRIGGIN’ AWESOME!!! I’m so doing this one day!! I had no idea France was the leader in perfumes or that Grasse was the capital of perfumes! You’ve just piqued my interested and added a new bucket list experience!! 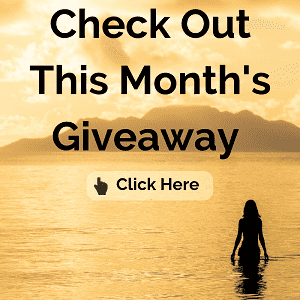 Thanks for being such a loyal member of #TheWeeklyPostcard community!